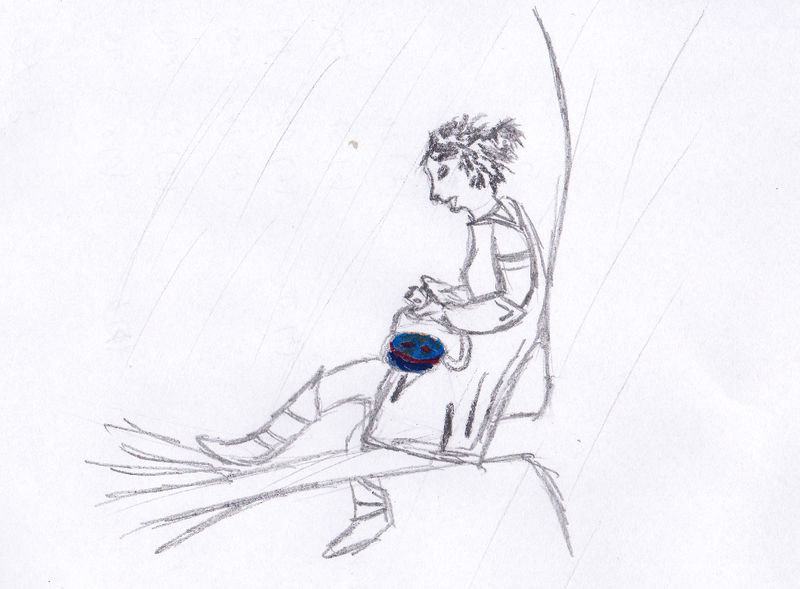 Linara was sitting high in the treetop of a tall oak. From the experiences of her homelands she knew that the height of a tree was the safest place, especially when travelling alone. Only few creatures would prey on humans there. Even less when it was raining heavily. Occasionally a drop of water found its way through the natural umbrella of leaves and landed on Linaras shoulder. Even when a heavy drop splashed on her head, soaking her wildly growing hair, she did not flinch. Nothing could break her concentration. She kept on sewing, trying to attach a further leather pouch to the front side of the strap of her bag. Linara was not very proficient in sewing. Nor would anyone be using a rough needle made of horn (which was hand carved using a stone knife). But Linara was not frustrated about the slow progress. She took her objection against metalwork very seriously. And she enjoyed the handcraft for which she had far too little time lately. The satchel Linara put so much effort to, she found a few years back. It was one of her first quests after joining the Emerald Enclave. And a rather easy one as well, as the Enclave uses to give to new members, testing their quality and encouraging them to deepen the relationship. The main Orcs force was already killed or flying when Linara and her party entered the cave to drive away the remaining scoundrel. They didn’t put up a big fight. Nor did they leave lots of useful treasures. The others complained that on Orc tribe who raided the villages for months ought to have picked up at least some valuables. And there it was! Beneath a pile of rubbish, clothes and leftovers Linara found a small bag. It was badly torn and covered in gore. But no matter what the others said, the bright red and blue colors still radiated a fascination Linara had never experienced before. It was as if the bag was looking – almost talking – to her. Nothing could part those two ever since. Linara realises, that the back of her shoulder is slowly warming up. As her trance like state of mind comes back to reality, she starts hearing birds sing. A look to the sky reveals slowly disappearing clouds and a sunbeam glancing through the wet leaves landing on her left shoulder. Linara snaps the thread with her teeth, pulls one last time and fastens it with a tight knot. After storing her tools in her bag, she climbs down the tree. Waterdeep is still a two days walk away.